Chicago Police on Friday said a 27-year-old man was arrested in the fatal shooting of a 9-year-old boy on the city’s South Side earlier this month. Police spokesman Anthony Guglielmi said Corey Morgan of Chicago was taken into custody on Friday. More information will be announced later about his case, he said, according to local reports. Police carried out “an arrest in the unspeakable murder,” Guglielmi tweeted in announcing the arrest. The child victim, Tyshawn Lee, was shot and killed on Nov. 2 in what police say was a targeted gang shooting. Police Superintendent Garry McCarthy said the boy was lured into the alley and was killed due to his father’s gang ties. According to CNN, the boy was shot in the face and in the back on Nov. 2 as he was going to a park down the street from his grandmother’s home to play basketball. His family has said he loved to play basketball and video games. A basketball was found in an alley next to his body. Investigators told WLS-TV that two other suspects were arrested in the shooting. An arrested warrant was issued for Kevin Edwards. Dwight Boone-Doty, 21, was also arrested in connection with the case, reported Fox 32 Chicago and the Chicago Sun-Times. Police allegedly found two handguns on the men. Both are being held on $1 million bond, police told Fox. McCarthy said Morgan is a documented gang member and a convicted felon. 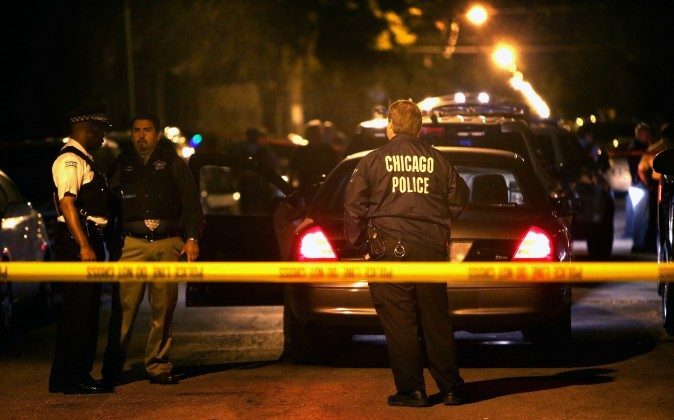 Chicago has been called the murder capital of the U.S., with 503 recorded murders in 2012. In 2014, the murder rate dropped, with 411 recorded murders. “How can a little boy, 9 years old, defend himself?” longtime resident Deronce Curd asked, according to CNN.